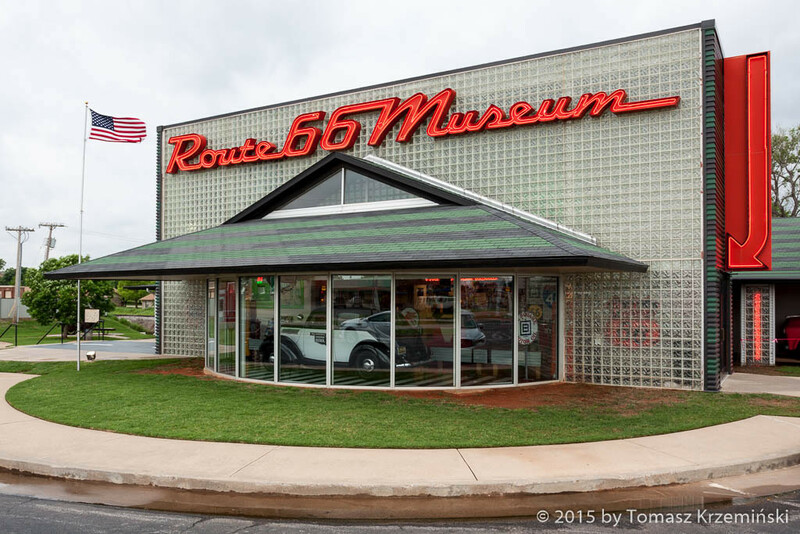 Route 66 Museum in Clinton OK, one of the best along the route. In interesting and simple way shows the whole history of the Road. Since it was built in 1926, through Great Depression in the 30. and crowds of Oakies heading towards fertile California in very old trucks; cordons of military machines in the 40., and then in the 50. and the 60. a boom when the Americans growing rich fast started to go for a vacation and weekends on Route 66; till the moment when in 1984 new interstate highway I-40 definitely took over the road traffic. And finally its revival thanks to which we can still travel Route 66 – today with a great sentiment and still great emotions. 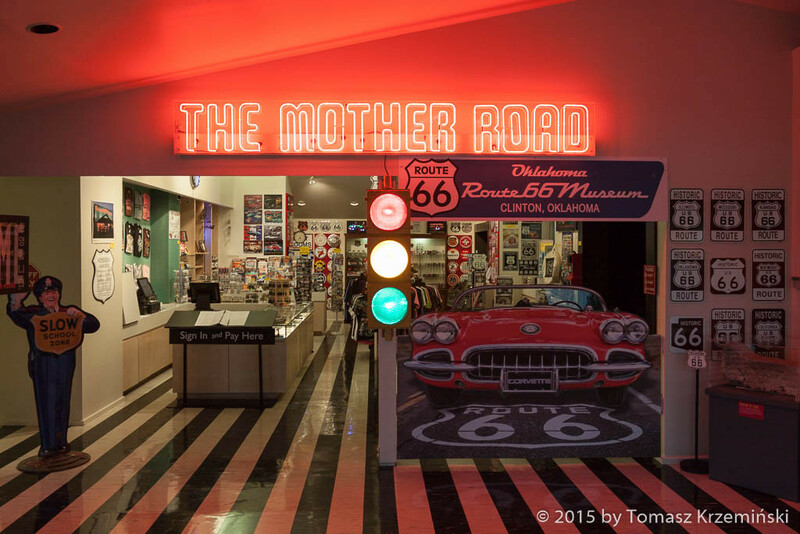 In second to last museum hall there’s a movie worth watching with historical photos of Route 66. 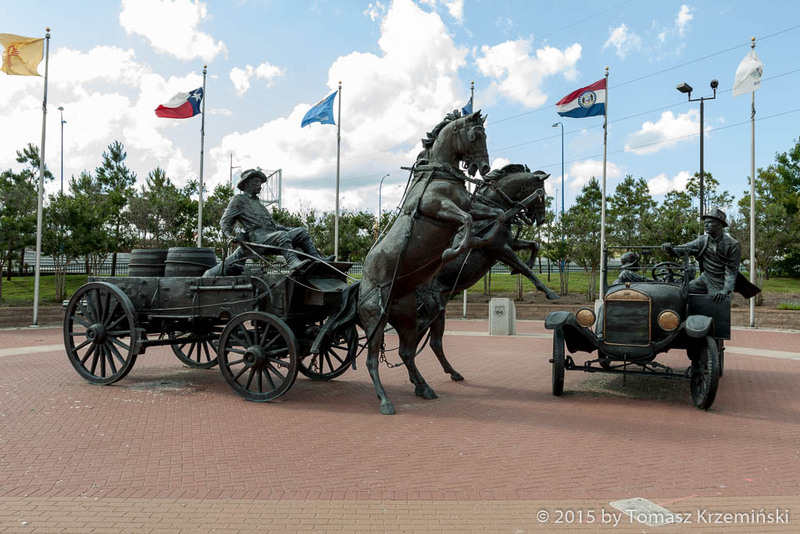 Stockyards City in Oklahoma City OK is entirely cowboy district of the town. 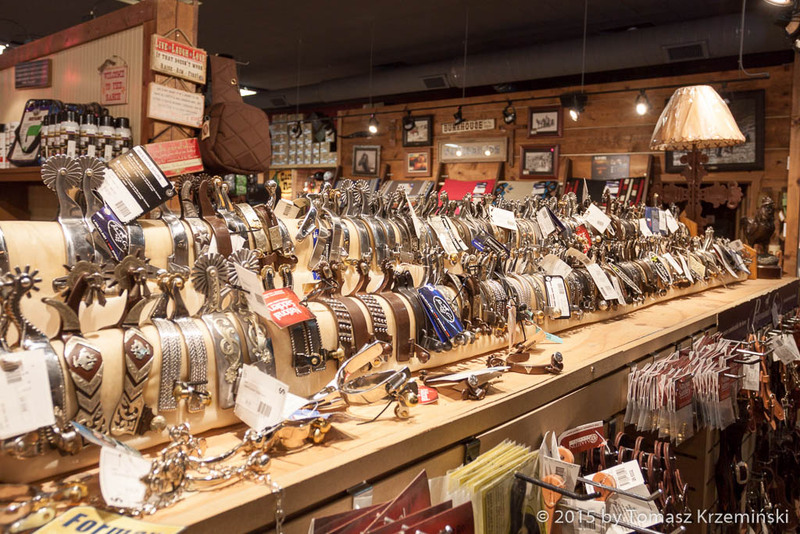 ...and shops for professional cowboys with shelves full of all kinds of lassos, glittering spurs, extraordinary saddles, next to furniture made of wood and decorations in western style – so beautiful that it makes you feel like you were in some gallery and not in a shop e.g. 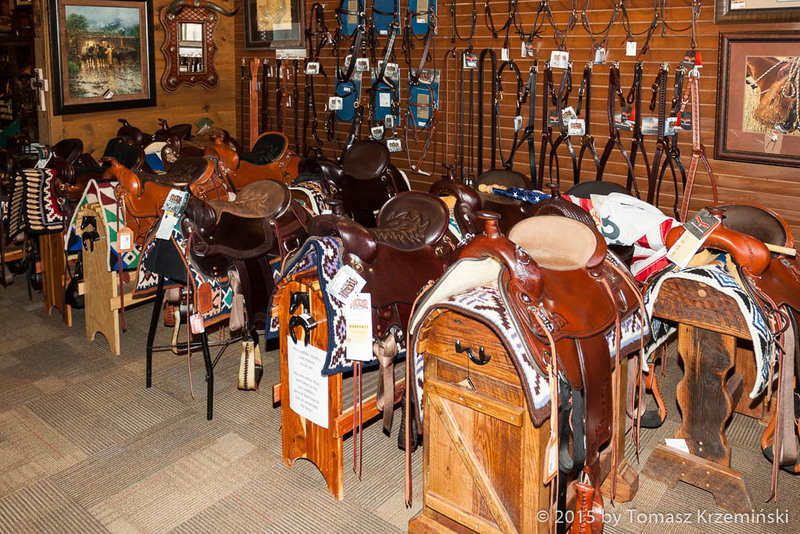 National Saddlery Tack. After shopping you can go to a restaurant and eat a steak, or go to candy and soda shop. 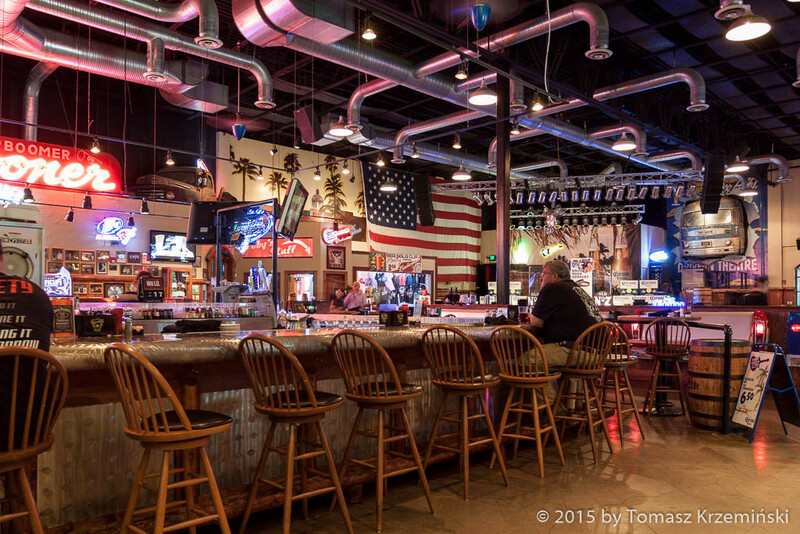 There’s also a concert hall Grant’s Rodeo Opry, the right place for a Saturday night. 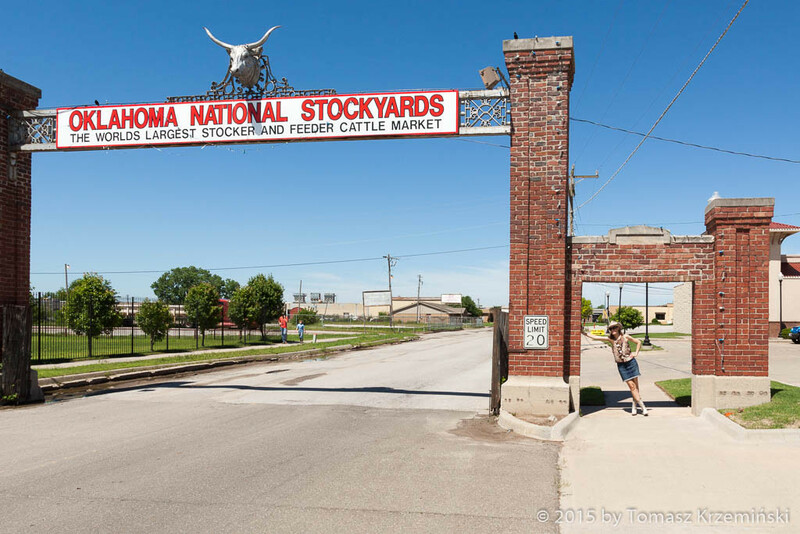 Oklahoma National Stockyards is the biggest cattle market in the world. From Sunday noon trucks with cattle for a sale start to come. 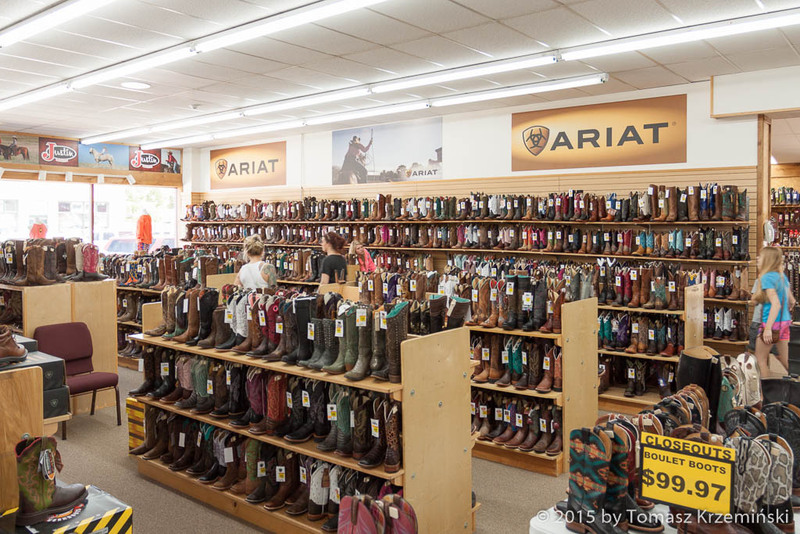 The sale will take place here on Monday morning. The area is very big which reflects on a popularity of this place. 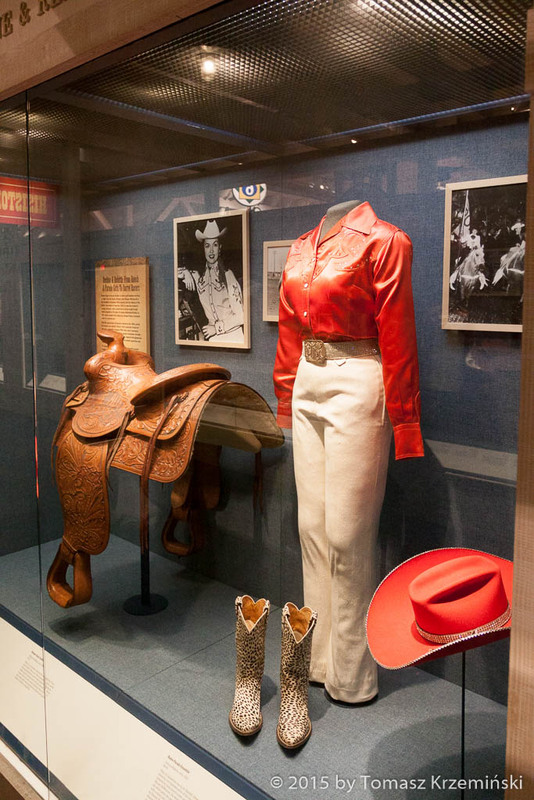 If you like Wild West and you like watching western movies, National Cowboy and Western Heritage Museum is just for you. We didn’t expect that museum could be so beautiful itself. Not to mention how interesting. 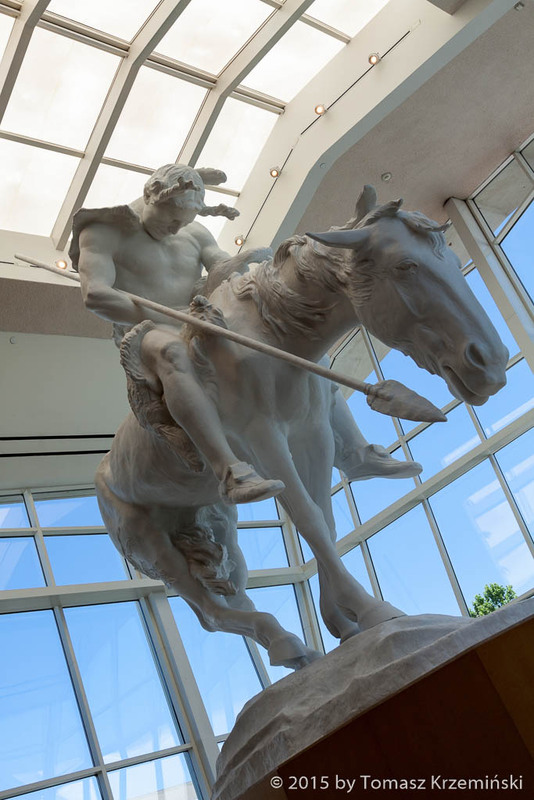 A fine collection of art, culture and everyday life of American Indians and Cowboys. Gallery of paintings (contemporary and older one, as if they were painted in 3D technology), sculptures, functional art and related to holidays and ceremonies. 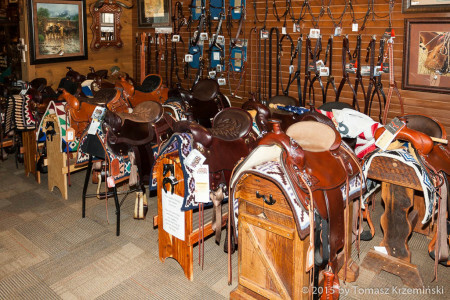 Indian and cowboy dress – with all kinds of cowboy hats and boots. 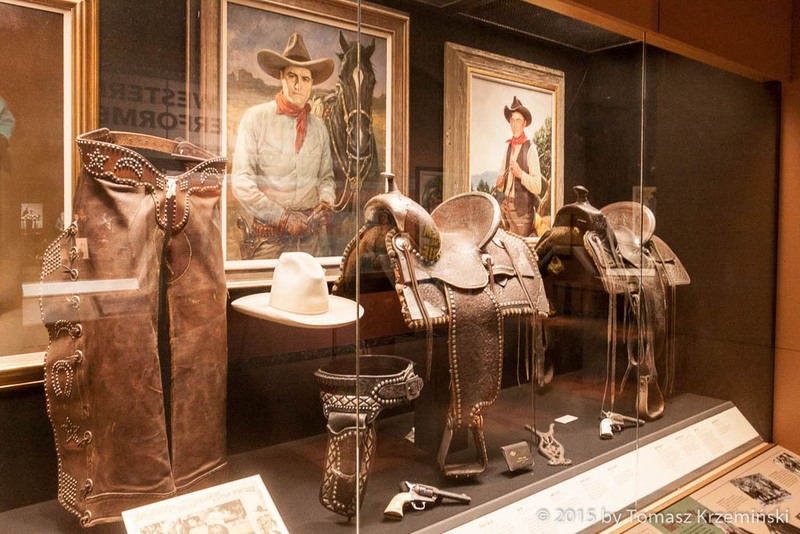 Pantheon of western movie and rodeo stars (it’s so special to look at the Americans who visit the museum and watch rodeo competition on these little screens, almost breathless and with mouth wide open). Even the mini-town like taken out from a western movie, where you can enter each of these 19th century buildings – school class, bank, blacksmith’s shop, coach house and railway station. Not only Washington, D.C. has its own Capitol – here is Oklahoma State Capitol. 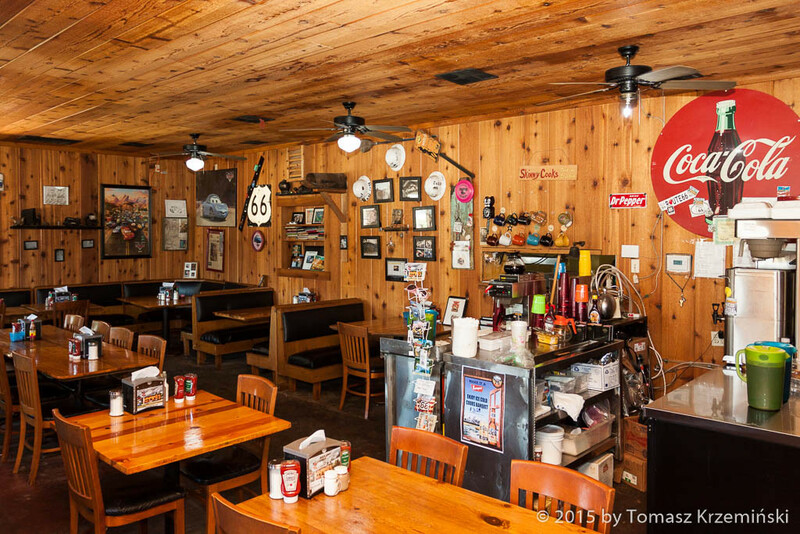 We stay in country atmosphere and we eat dinner in the restaurant signed with a name of one of the best country musicians Toby Keith - Toby Keith’s I Love This Bar and Grill (these are the words of his song, although there’s not a single word about grill ;-) ). And again there’s delicious food and really cool decoration, what we already take for granted. 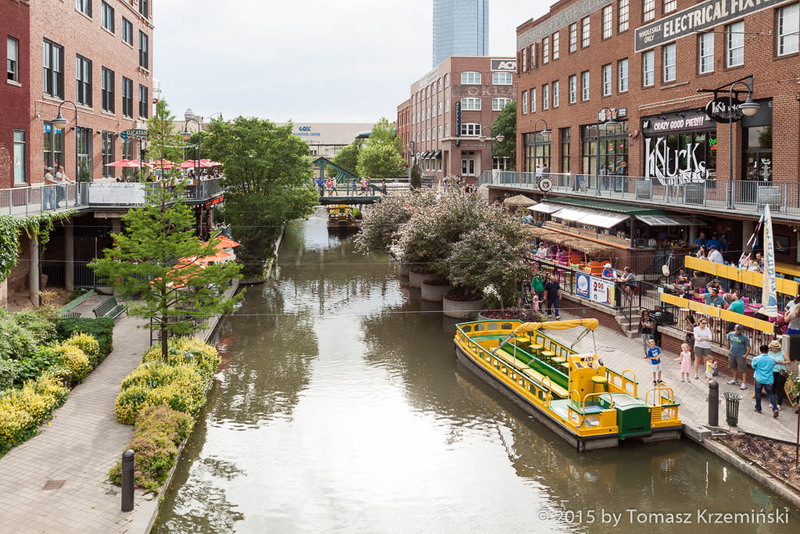 Bricktown Canal is a new district of Oklahoma City – park and entertainment. Buildings with brick walls, a lot of restaurants and canal where you can go boating. A place for a walk and taking a deep breath out of a big city. 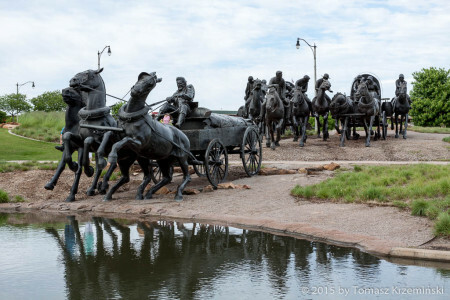 Oklahoma Land Run Monument – tremendous memorial, finished in 2015, in honour of land run which took place on this ground in 1889. Dishonorable fragment of the USA history. 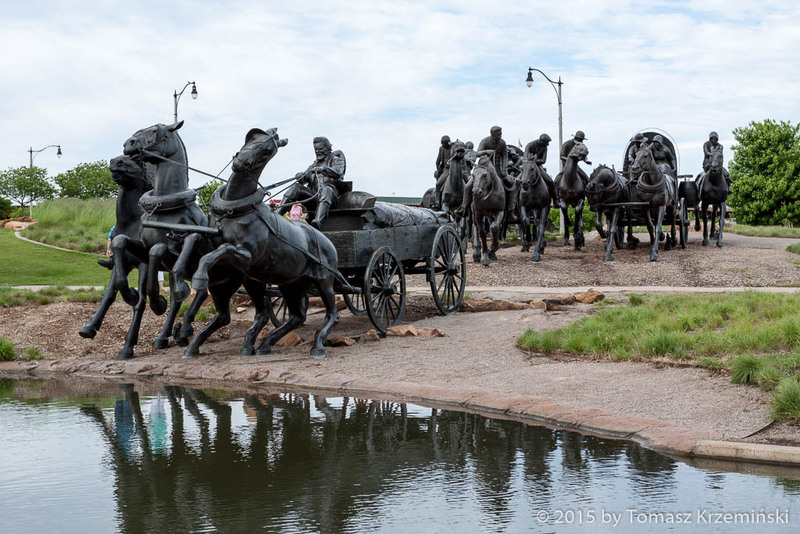 In appointed place and hour they gathered crowds of people who wanted to settle down on this land of Oklahoma, which belonged to American Indians so far (what’s more they took away other Indian lands before and resettled Indians to these grounds). When the cannon boomed everyone started to run, to ride a horse or to drive a wagon towards intended plot of land which – if you had come first – would have become your property for a very little money. The monument is located on the south end of Bricktown Canal. 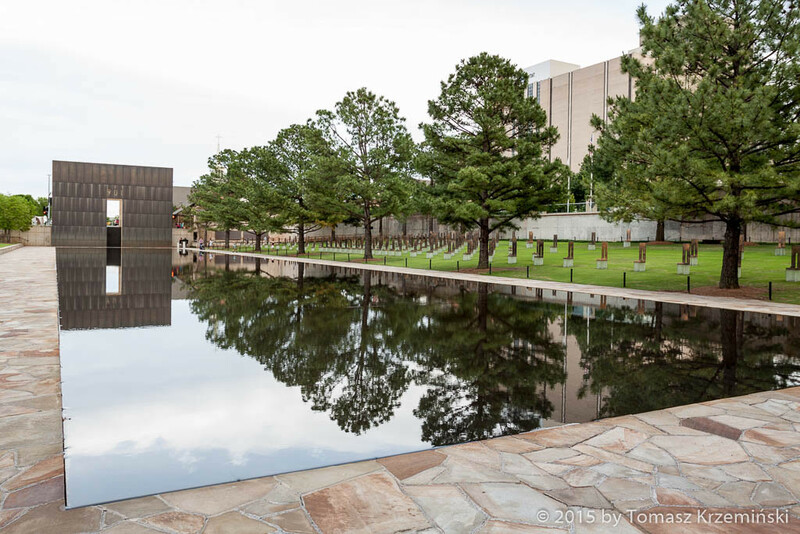 City Memorial is a place which commemorates one of the first serious terrorist attacks in the USA. It was built together with a museum exactly on this ground where till 9:02 hour 19th of April 1995 governmental building was standing. That crime was committed by two men who escaped unhurt (they detonated a truck full of explosives in the front of main entrance), but they were caught and sentenced. 168 persons died, 680 persons was injured. The explosion was so strong that it damaged several hundred of surrounding buildings, together with historical church, which remains you can see close to the memorial. Two gates commemorate 9:01 hour just before the attack and 9:03 just after. 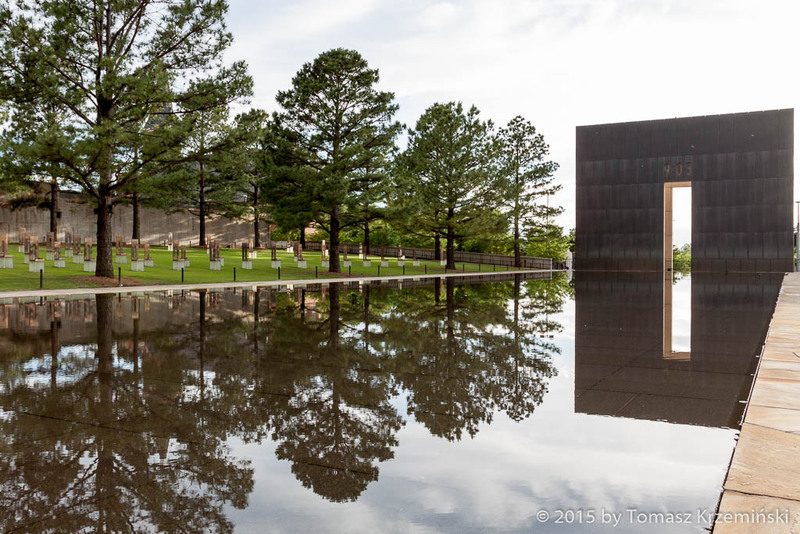 Between the gates is a field of empty chairs made of glass, bronze and stone. They symbolize every single person who died in the attack. The chairs are set up in nine rows, according to the floor on which the victim used to work. The separate column of five chairs symbolizes persons who, in the moment of attack, were near this governmental building, and lost their life. The notice on the western gate says: We come here to remember those who were killed, those who survived and those changed forever. May all who leave here know the impact of violence. May this memorial offer comfort, strength, peace, hope and serenity. Pops in Arcadia OK is a rare combination of a gas station and cafe with a shop where you will buy only a soda. 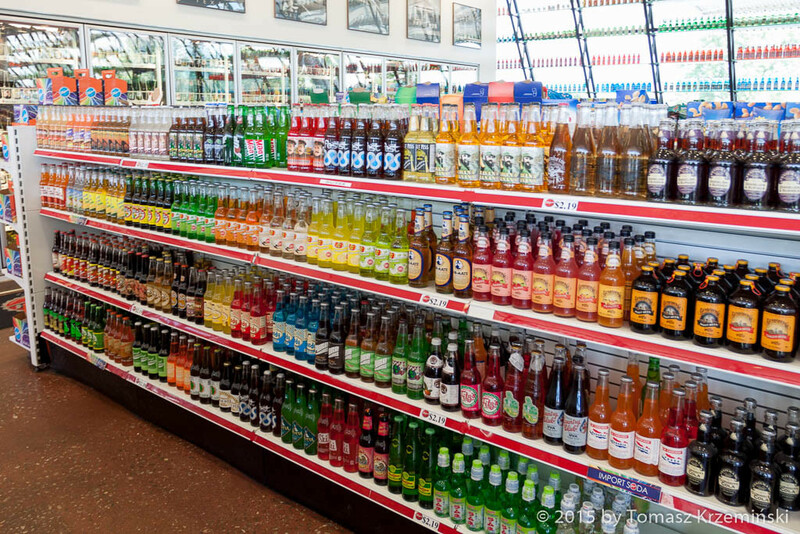 But try to choose a flavour from among… 700 kinds which stand on the shelves here! This place is hard to miss because of the bottle located at the entrance. 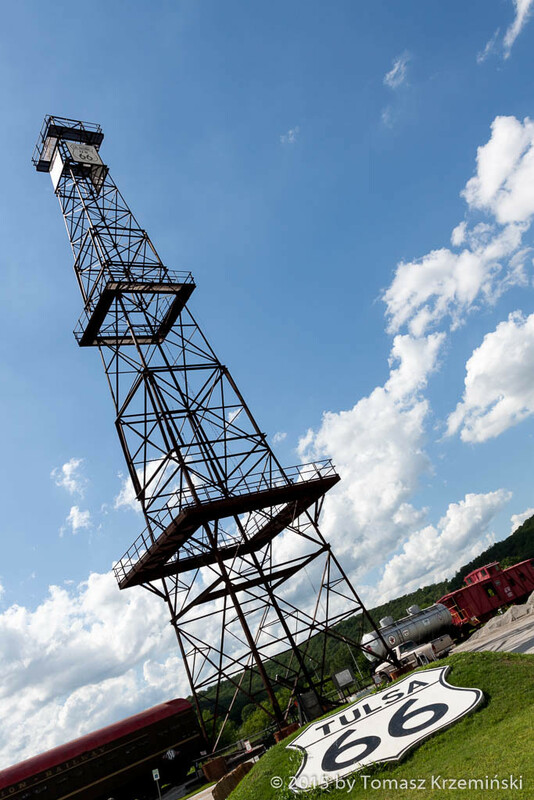 It is 66 feet high (that’s 20 meters). 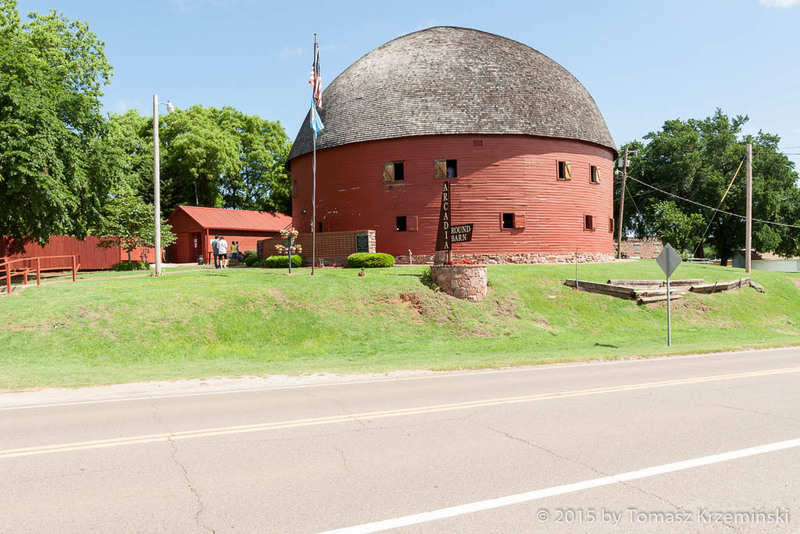 Round Barn in Arcadia is a popular place on Route 66. We visited it on Monday. As it turned out in this very day Mr. Sam shows visitors around. 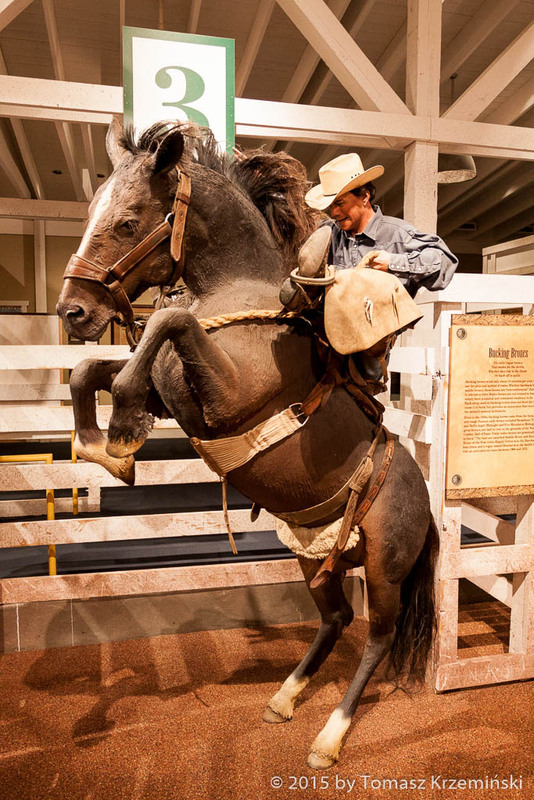 He is a 89 year old man, in elegant cowboy dress, so vibrant with life, fit and vigorous as he was 20 years old. He is charismatic – and such people you hardly ever meet (although in the USA more often than in Europe). 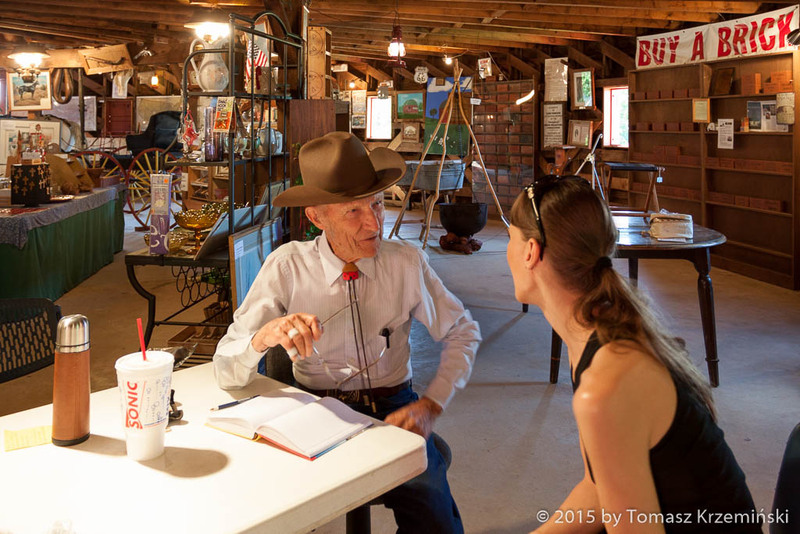 With verve he amused us with his stories about the barn, history of the USA and his own life since he was a little boy. 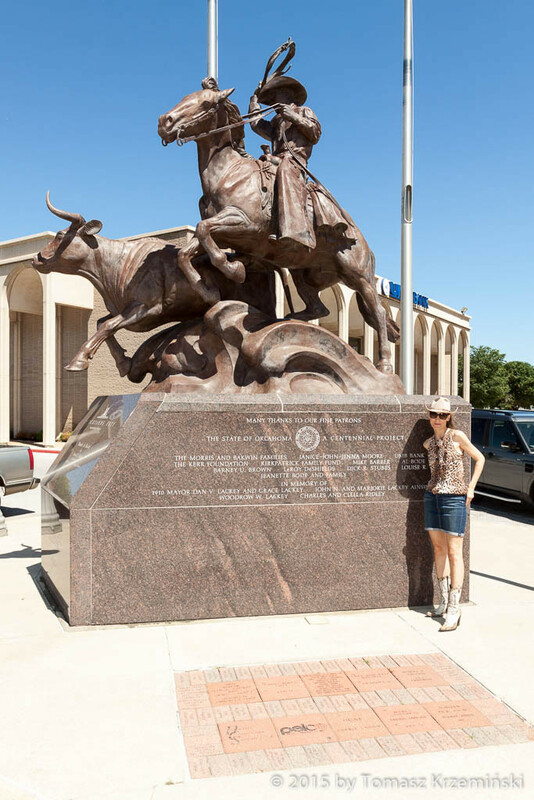 In the old days area of today’s Oklahoma belonged to American Indians who were brought here from all over the United States (at that time from east coast), because nobody wanted this land then. But soon it turned out that here’s a fertile soil, the country was growing fast, so the white people wanted to get also an Indian land. 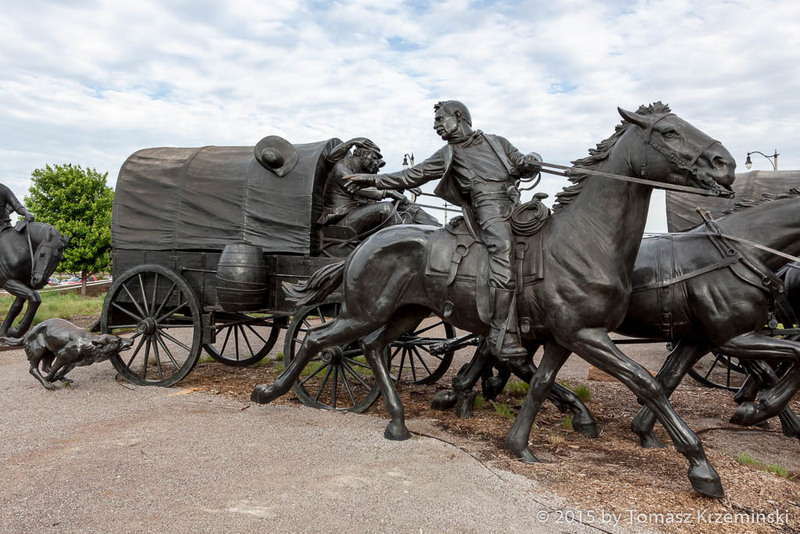 They organized the Land Run – everyone could get 160 acres of land. The neighbour of Sam settled in here in this very way. He had come two weeks before, traveled around all of the plots and chose the right one. He managed to reach it as first during the Land Run. Sam bought his 160 acres of land as a 20 year old boy from his aunt, who wasn’t able any longer to run this big farm because of her age. 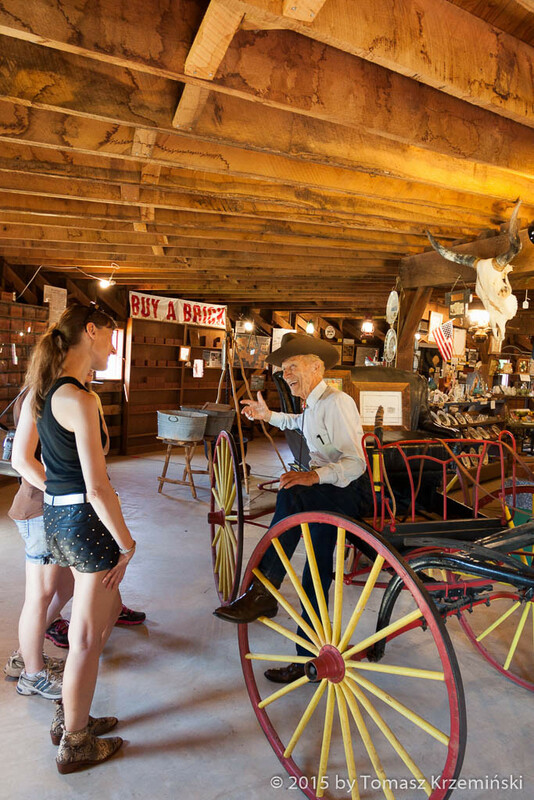 His farm – Rock of Ages is 3 miles away from Round Barn and there’s the oldest house in this region. Years ago in the front of the house there was a haystack. Sam became interested if anything could be hidden in there. 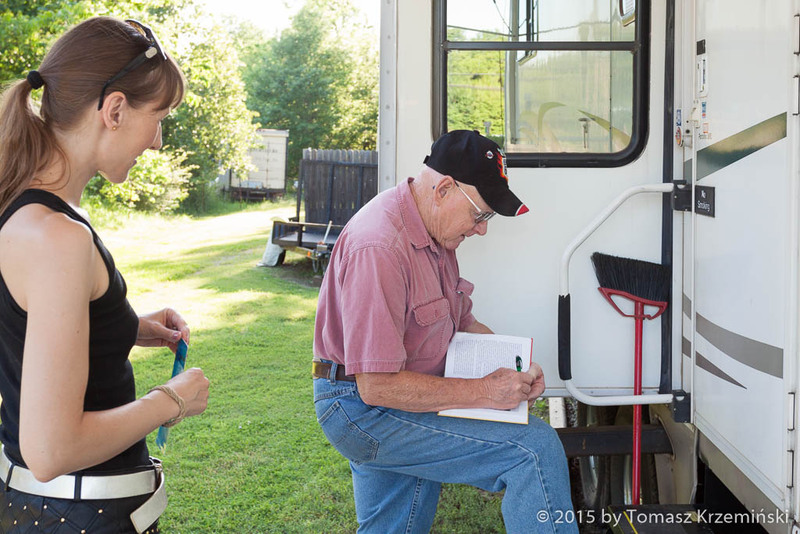 He started to dig and he found… beautiful old carriage! His aunt said with a pinch of salt that she doesn’t want it and he can have such a piece of junk. So he renovated it and today it stays in Round Barn as an exhibit. The first Sam’s car was Ford T of a dozen years or so. Nowadays it’s a classic of motorization. Sam used to say that he married the most beautiful woman on the earth. But he adds that it’s from his point of view of course. Everybody loved her. They lived together happily for 45 years. In the 5th wedding anniversary he took her to a dinner. She asked him whether she can wear her wedding dress. He said yes she can. And they went to a photographer on this occasion. It was 1975. After few days they collected the photos. But it was on the day when almost 30 guests were coming to their home for a party. In the heat of the last preparations Sam’s wife put the envelope with photos among some newspapers in the kitchen, and then took it all together to the attic completely unaware. She couldn’t recall what she did with this precious memento for years. Two weeks before her death Sam found it and he managed to show this photo to his wife. And also we saw the copy. His wife died just one month before our meeting. In memory of Sam’s wife, the hosts of Round Barn planted a flower bed right at the front door of the barn. Today Round Barn belongs to the society formed by the local farmers. 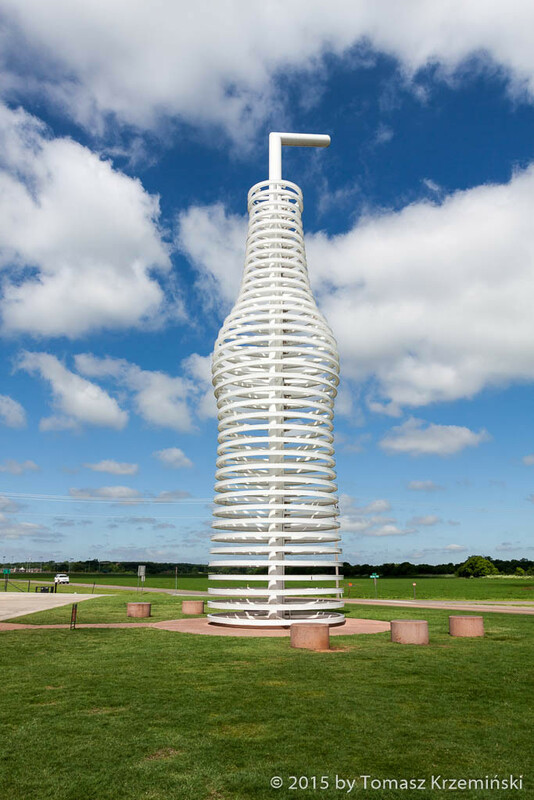 Previous owner wasn’t able to keep it because it’s a historical monument and he sold it to the people who had an idea and willingness. 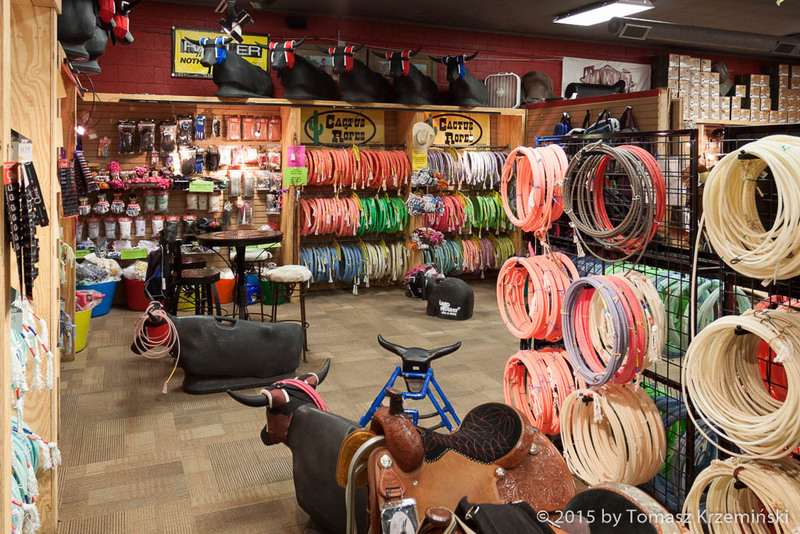 Every little place is created by people, which is best proven by Round Barn. 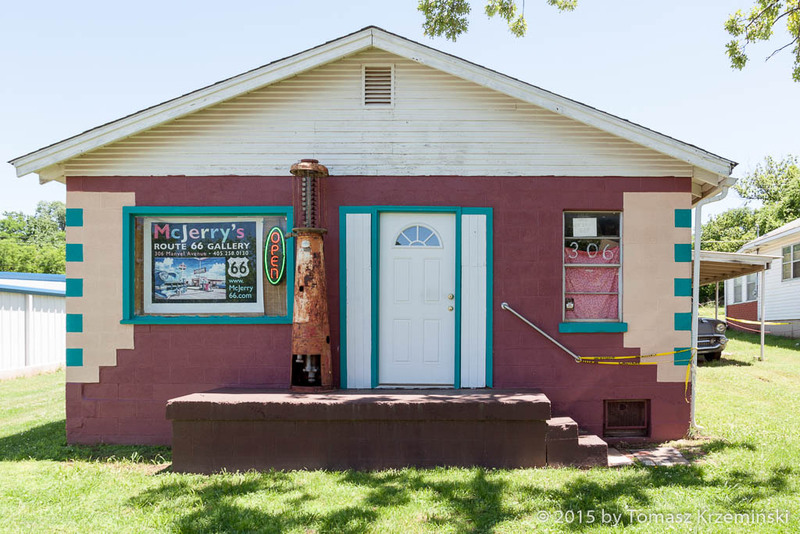 McJerry’s Route 66 Gallery in Chandler OK. Jerry McClanahan is a well known person on the Route. 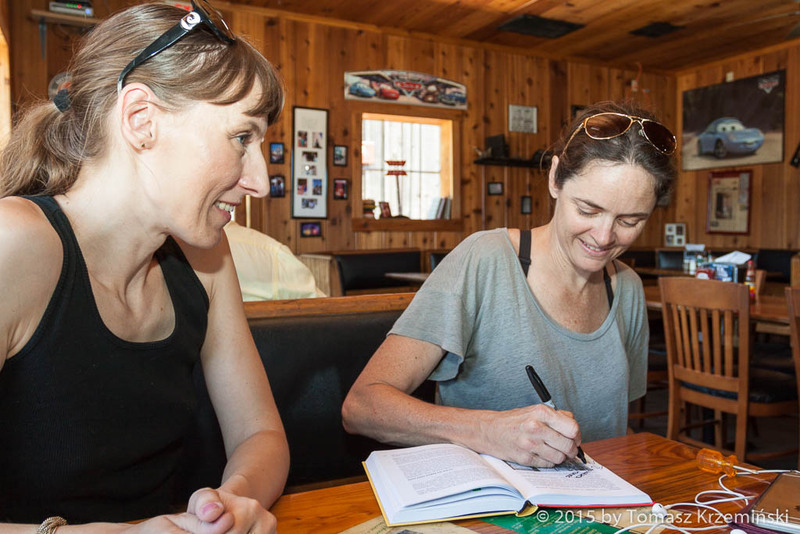 Graphic artist, with love and sentiment explores Route 66 again and again. As a child in the 60. he used to travel on Route 66 with his parents on almost every vacation. The western world seen with eyes of a child – mountains, American Indians and cowboys, colorful neon signs at the motels along the road, all of it left wonderful memories. So wonderful that Jerry pictures mainly then and today’s Route 66 on his paintings. 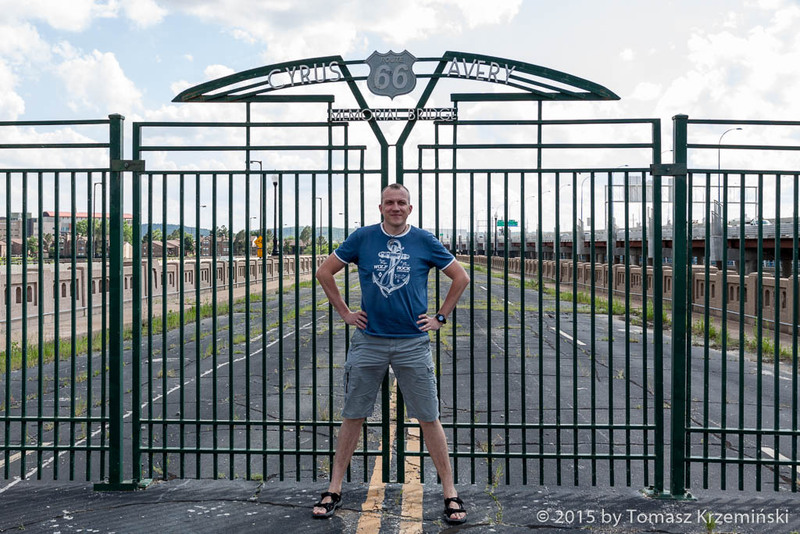 He is an author of the best Route 66 guidebook “EZ 66 Guide for Travelers” (the third edition was printed in 2014). 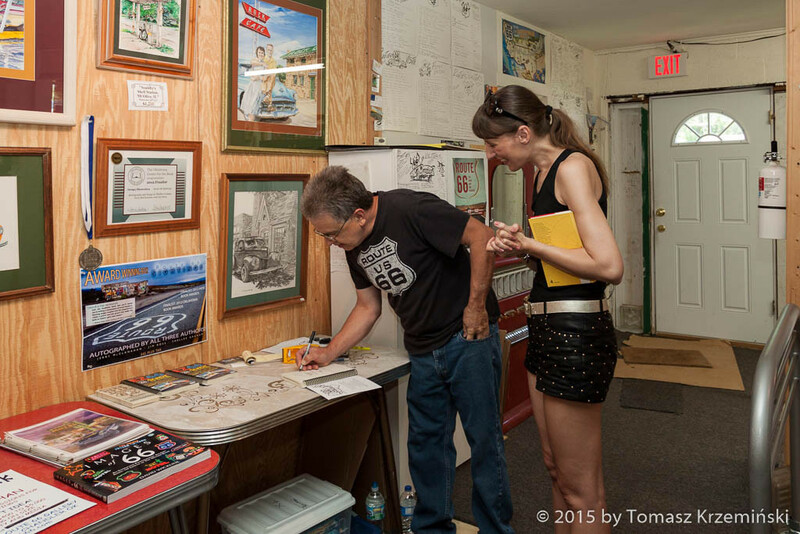 And also together with Jim Ross he published illustrated set of eight maps of Route 66 (one for each state). It is second in turn best-selling edition supporting travelers. 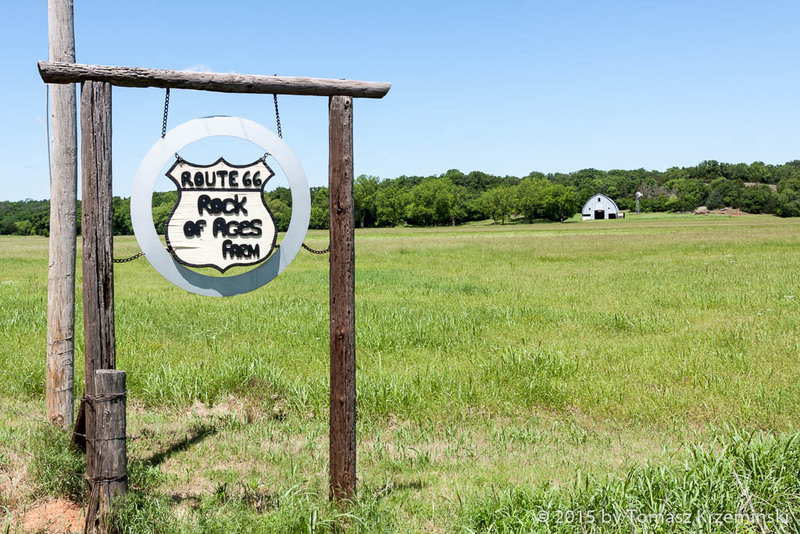 This road is addictive, but you will know this not until you find yourself on Route 66…! Rock Café in Stroud OK run by Dawn Welch. I recognized her at once when we had got out of our car, in front of this famous stone building. This 40 year old woman, having a teenage girl appearance, walked in our direction. She is full of strength and never gives up. A few years ago her café burned down completely. I considered coming here, to the ruins. But when we started our travel on Route 66 and we met people here, I became convinced that perseverance and overcoming life difficulties, when you fight for your dreams, is the main feature of people who lives by the Road. So I was sure that in Stroud there is rebuilt Rock Café and I will find Dawn there. And I wasn’t mistaken. Dawn lives here since 1993. It took her one year and eight days to rebuild this building, although she spent more than half a year looking for skilled workmen. They don’t build brick and stone houses in the USA, so nobody knew how to rebuild this one. At last she found a man who used to work in Europe after II World War building houses over there. He had only one helper but he was the one who knew what to do in this situation. Good neighbours of Dawn helped at work. Thanks to them all today a friendly funny waitress serves a lot of yummy things to the strangers from far-away countries. Dawn looks after the kitchen and the whole of the café. On the walls in the hall you can see interviews conducted with Dawn and prizes which she got for persistence in business and cultivating the tradition despite the fate which sometimes plays jokes on us. It’s interesting what Dawn told us about the time when she bought Rock Café. She registered it on a list of vintage buildings, and that’s why some photographers came. They were taking a lot of photos what really bothered Dawn who was focused on the renovation in that very moment. After years thanks to them she could rebuild Rock Café to the smallest detail. Without this photos the building would not come back “alive” in this shape. Road closed. 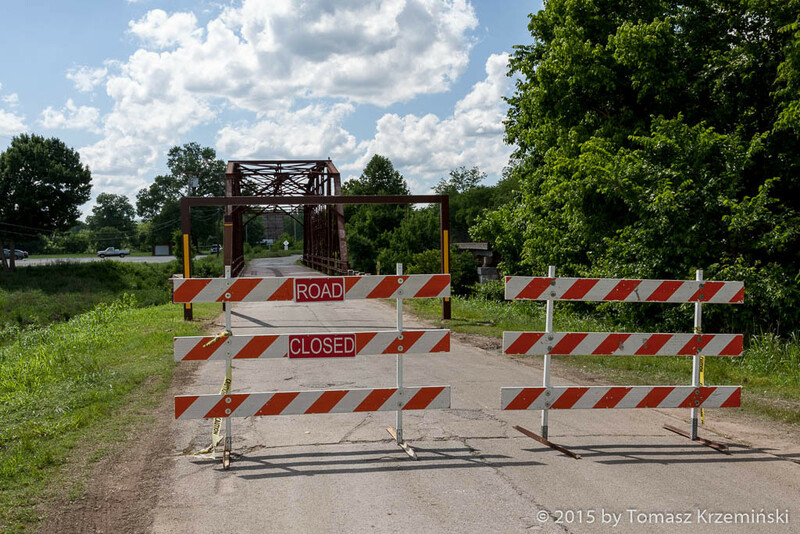 But who knows whether in one or two years time renovated bridge will attract thousands of visitors, as it already happens in many places along Route 66. 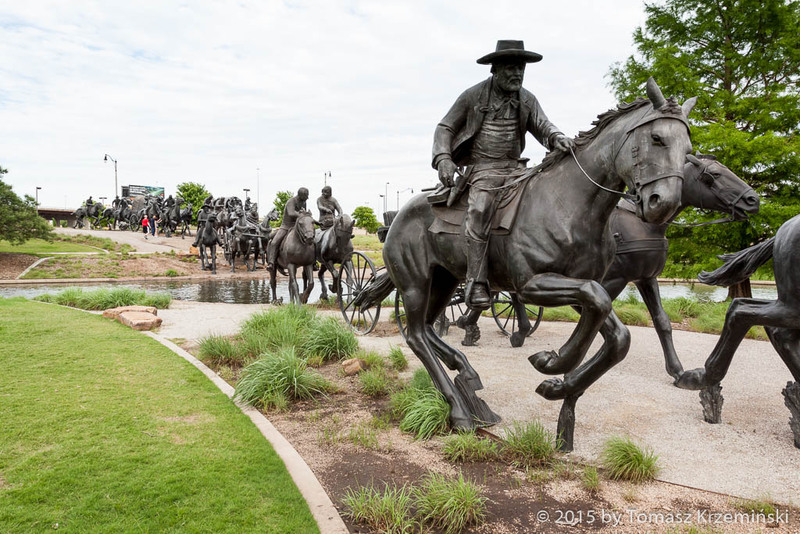 (Civilized) East meets (Wild) West – the monument made of bronze in Tulsa. Memorial Bridge nearby, unfortunately out of order for the time being. 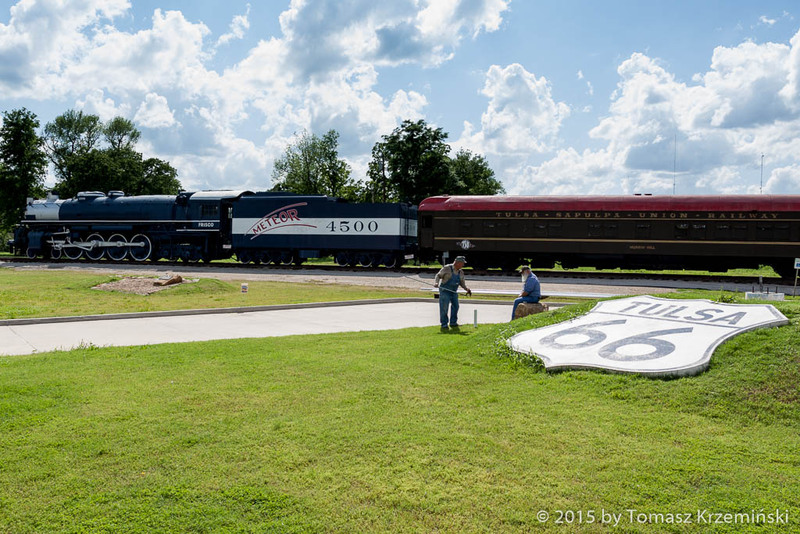 It is named after Cyrus Avery who is called the Father of Route 66. 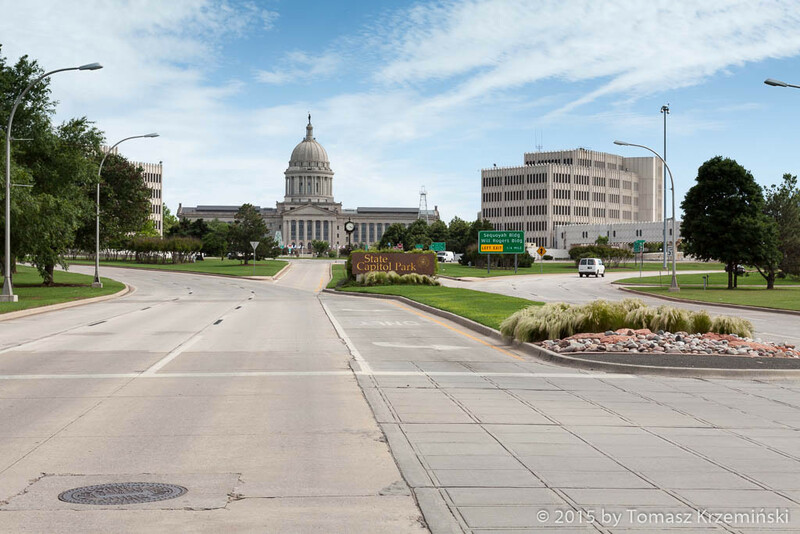 He had a passion for roads (in his time motorization has begun), he was a visionary and he had an idea for construction of the road which could connect East with West. This plan was quite new then, even revolutionary, especially when you take into account that roads were administered by cities and counties not the state or country itself. 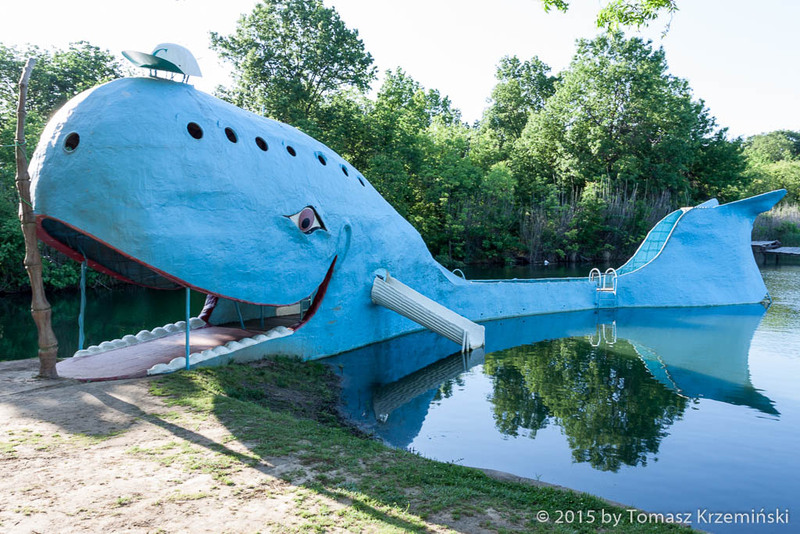 Blue Whale in Catoosa OK – a wonderful attraction and a very popular bathing beach at Route 66 once. This Blue Whale is a jetty at small beach. There’s a slide, diving platform and diving board. A very nice place among green area, with benches fitted for a picnic, where once they used to spend here days and days of summer, and where now you can make a longer stop during your travel. The whale made of concrete was built 48 years ago by father of Blaine Davies. He was a popular director of local ZOO. He loved animals so much that he established additional mini ZOO for baby animals, right by their house. Blaine with his sister were brought up among chimpanzees, alligators, snakes, and they even had a bath with grizzly bear once. Today Blain lives in mobile home at the beach and for the winter time he moves to Texas, because it’s warmer over there. An elderly gentleman, retired, full of warmth, looks after Blue Whale with tenderness, for the joy of kids and adults the same. 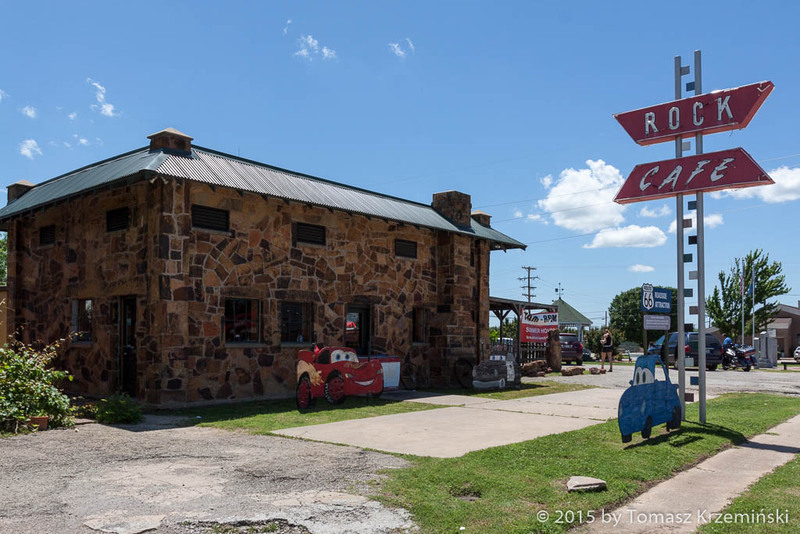 Length of Route 66 in Oklahoma is ca. 432 miles (ca. 695 km).